Everybody’s getting old. Old Man Logan. Old Man Hawkeye. Old Lady Harley. Star Lord he latest hero to get the geriatric treatment in Old Man Quill...a series that begins its year-long journey in February. The first issue in the twelve-issue series is written by Ethan Sacks with art by Robert Gill. Colors come courtesy of Andres Mossa. While it’s heavily rooted in a tired-old space opera aesthetic, there’s more than enough inventiveness in the issue to build a solid first chapter for a 12-part series. The story opens in a flashback. An aging Peter Quill is the Emperor of the planet Spartax. When an invasion by the Universal Church of Truth doesn’t go quite the way that Emperor Quill plans, he falls into a heavy depression, he falls into a bleary, drunken haze entombed in a space station orbiting the site of his failure. Somewhere in the midst of Quill’s sadness, Rocket Raccoon, Drax, Gamora and Mantis show-up to engage Quill in the mother of all interventions in order to interest him in saving the galaxy one more time. Sacks’ composition of the first issue is thoughtfully put-together. The first third of the issue establishes an older Quill as the emperor of an entire planet with a wife and two kids. The second third has Quill being confronted by the old Guardians team, allowing the team to launch into adventure in the final third. It’s sharp pacing. Once again a forgotten hero must return to action for another adventure. There isn’t anything terribly original about it, but Sacks finds clever little moments. 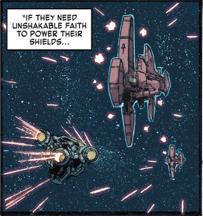 An invading galactic religious empire featuring space fighters protected by faith-based shields is a particularly clever, little detail. So is the appearance of an aging anthropomorphized raccoon complete with cane and cybernetic prosthetics. Details like that keep the story engaging through its first chapter. Gill does a respectably job with the art. Detail is rendered where it needs to be rendered. Movement feels authentically kinetic when it needs to move. Gill’s treatment of a laser-based dogfight in space moves across the page with a bracing sense of motion. Emotional drama feels kind of static, though. Every bit of tense conversation feels motionless...like the characters are posing for a picture before getting on with the business of yelling at each other. The kinetics of conversation might not come across with a whole lot of energy, but it IS delivered with great detail, which serves the advanced age of the characters quite well. Quill and Rocket really look like a pair of crusty, old space pirates who have seen too much action...a situation that serves Rocket quite well. No one’s ever been able to draw him with the kind of energy and personality that Mike Mignola did back in 1985, but Gill does a solidly respectable job of making him look ancient and dangerous...like a feral beast who has seen one too many battles. Sacks and company have an interesting opportunity here. The plot structure of the first issue seems to suggest that Quill, Rocket and the rest of the group have been through a LOT since they were last together. If Sacks can tap into the unique dynamic of a group of people working together for the first time in ages to save the galaxy, the next 11 issues could be a lot of fun.